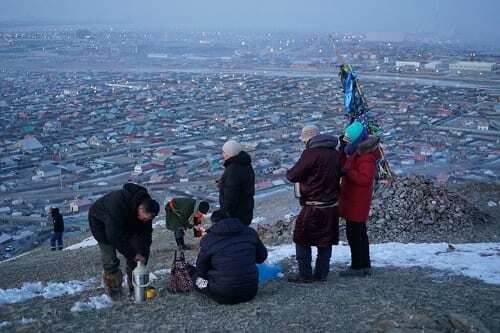 Watching Tsagaan Sar preparations in Mongolia via the internet, this year Marissa Smith noted a distinct concern with products that comprise the tavgiin idee or ‘table food’. 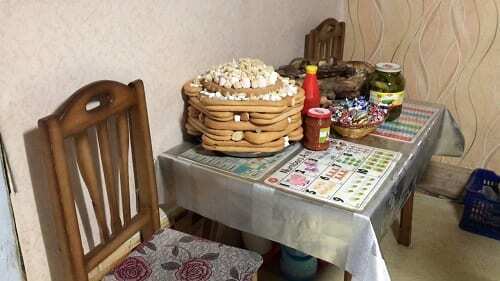 This consists largely of hard bread (kheviin boov, ul boov, eeven), dairy products (tsagaan idee), candy, salads, beverages, and other edibles that form the centerpiece of household guesting tables. Though early in the season of social media posting about Tsagaan Sar it looked like golden dogs made of salt might steal the show, the star of this year’s holiday is clearly the boov. Bankhar dogs made of salt, for the ‘Yellow Earth Dog’ year, atop the structures of boov and tsaagan idee that comprise the centerpieces of tavgiin idee. Smith suggests that this concern reflects the continued poor state of the Mongolian economy, in which ties with the household and a few immediate family members on the one hand and the Mongolian nation on the other hand are emphasized. Over the past three years, the UCL Emerging Subjects Tsagaan Sar Index has documented links between inflation, an increasingly devalued tugrug, and ever-growing personal debt on the one hand and changes in patterns of hosting and gifting during Tsagaan Sar on the other, particularly a trend towards gifting less and less. As in previous years, Tsagaan Sar is being celebrated with traditional, national Mongolian products, and with fewer and fewer durable (i.e. clothing such as Mongolian-made wool socks) rather than consumable goods (i.e. food and drink, and increasingly less expensive ones – perhaps a component of the focus this year on boov with almost no mention of meat at all), and with gifting less money. In the eastern countryside, Jessica Madison-Pískatá observed a similar shift in gift-giving practices. In addition to fewer durable goods, she also observed a continuing shift away from high-prestige consumables that must be purchased in Ulaanbaatar (i.e. limited edition New Year’s negj prepaid phone cards, tea bags, and vitamins) to edible ones that can easily be procured locally. The amounts of money spent and debt taken, according to studies shared by Mongolian researchers, particularly the Mongolian Marketing Consulting Group (shared by Rebecca Empson), are comparable to those of previous years, but with somewhat less money spent and more debt taken than in previous years. The Mongolian Marketing Consulting Group reports that those polled said that boov were the Tsagaan Sar item people were least worried about, gifts for guests the most anxiety-provoking, and that the biggest challenge in buying Mongolian gifts was their expense (74 percent of respondents). Нэг өрхийн цагаан сарын зардал 2016 оныхоос 72.1 мянгаар нэмэгдэж, ₮1,074,831 болсон байна. Улаанбаатар хотын өрхүүдийн 59%, хөдөө орон нутгийнхны 64% нь зээлээр #ЦагаанСар-аа тэмдэглэж. Seventeen percent increase, compared to last year, in households taking loans for Tsagaan Sar, infographic based on MMCG Data. Tsagaan Sar expenditures by top, middle, and low-income households, MIRIM Consultant. Perhaps most strikingly in contrast to past years, however, this year there is a notable focus on celebrating in one’s own household, as evidenced not only by the wealth of advertisements and conversations about tavgiin idee rather than gifts one would hand out to guests and obtain from hosts, but also by how the holiday was documented on social media. 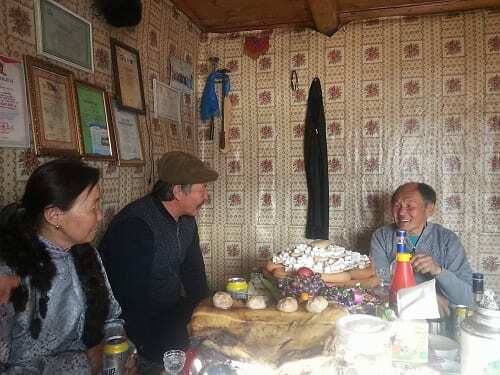 Rather than depict visits to other households, extended relations, friends, and coworkers, Mongolians seemed to be focusing on their immediate households and/or being more circumspect about making public whom they are connected with in what ways. (Evident to Smith through searching on Facebook for the popular greeting, Saikhan Shinleerei). As many scholars of Mongolian sociality have emphasized, the wrong kinds of relations are not only ungenerative, they are anti-generative (Empson 2011, Empson and Delaplace 2007, High 2008, Hojer 2004, Pedersen 2011, Smith 2015). Showing the wrong kinds of Tsagaan Sar visits to the wrong people might contribute to claims on generosity and envious, malicious gossip, which undermine the relationships required to produce, reproduce, and exchange wealth, contributing to problems of excess, waste, and disease. Madison-Pískatá also saw a shift away from meat and vodka at the Tsagaan Sar table, not only as it was offered, but also consumed. Throughout her visits, she observed multiple instances of guests refusing vodka to little protest, a marked increase from previous years that seems to follow the national trend of cutting back on vodka in favor of lower alcohol content options. At one household, guests were offered Bulgan airag (a high-prestige item, particularly in Sukhbaatar Province, where the vegetation is said to interfere with the flavor of mare’s milk) and red Bulgarian wine as an alternative to vodka. This is not to say that vodka does not still hold great ritual significance, and as in previous years, guests were still required to partake of the host’s vodka at least one to three times (depending on the age of the household—younger households hosting for the first time were more likely to hew closely to the customary three). However, visitors were not pressured to imbibe above the ‘ritual minimum’, especially if they were to cite health reasons for their refusal. Similarly, there was a decrease in both the serving and consuming of meat, especially sheep’s tail. 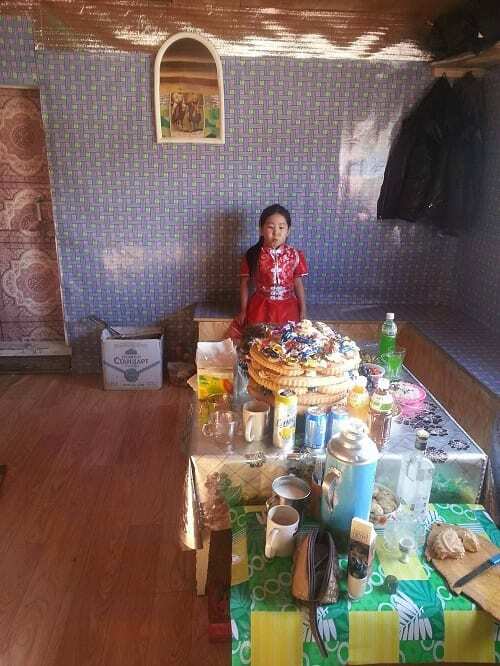 Madison-Pískatá visited only one household that served tail on their Tsagaan Sar table, from which, despite the daughter reporting a steady stream of guests all day, there was only one small shaving eaten. As is indicated in the data from the Onom Foundation, this concern does not extend to boov. 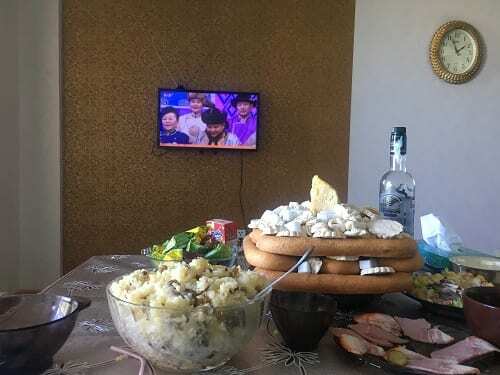 In addition to boov and airag being increasingly swapped out for meat and vodka, wine and fish were also added to many Sukhbaatar Tsagaan Sar tables, bringing with them both the prestige of foreign products and the image of a kind of healthful exoticism. In the facebook group Chatnaa Okhindoo!’(‘You can do it, girls!’), where discussions often revolve around health and weight loss, both wine and fish are often brought up as part of healthy ‘foreign’ diets, most commonly as part of the trendy ‘Mediterranean Diet’, which is extolled as a panacea for good health and ‘wellness’, in the same breathless manner as it appears in women’s magazines in the Anglophone world. These observations are in line with public ‘healthy lifestyle’ campaigns, women’s weight loss clubs, and a general concern with healthful eating that have been increasing in both number and relevance in Sukhbaatar Province over the last five or so years. In Madison-Pískatá’s interpretation, this indicates an increase in the bargaining power of individual agency when leveraged in interest of the health and well-being of the individual body. This is not, as Buyandelger points out, part of a post-socialist ‘transition’ narrative that argues for a unilateral shift towards the ‘individual’ at the expense of the ‘community’. Rather, it appears to follow the idea that a healthful individual body directly contributes to the greater health of the community. 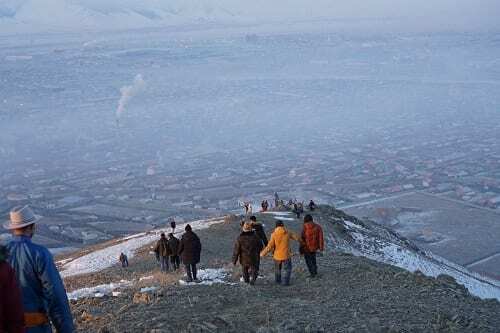 In her work on air pollution protests in Ulaanbaatar, Chisato Fukuda also emphasizes how the bodily experience of air pollution, particularly miscarried pregnancy, has drawn individuals together in collective response. Smith notes that, on the flip side, as disorder in the social and its governance is intimately associated with chronic disease and responses have entailed reordering the social, relations between the state and the people have been of central importance. 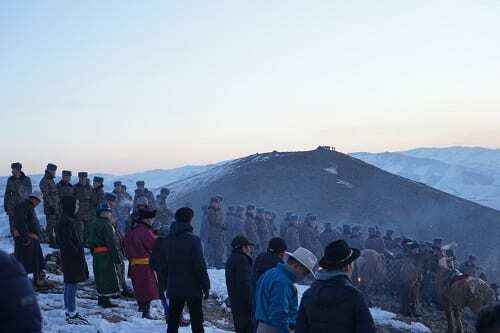 In past years, initiatives by the Mongolian military, President, and members of Parliament to celebrate with milk rather than vodka gained traction (Jargalsaikhan 2012) that is not evident in connection with the liver disease NGO’s initiative. The importance of the government as an actor or set of actors to be chastised in these narratives centrally concerned with proper ordering of social and individual action to align with stateness (tur) is demonstrated in posts on the Emerging Subjects blog by D. Bumochir (on ritual ‘punishment’ of politicians for mishandling mining agreements), Kh. Uyanga (maternal responses to measles outbreaks and associated infant mortality that offered mutual assistance and reprimanded government health agencies, see also Fukuda 2017), Sh. Tuya (the taking up of the Paris Climate Accord ‘shoe protest’ to demonstrate a public reprimanding the government in Ulaanbaatar), and Hedwig Waters (on the articulation of these critiques also among those who would not publicly expose or elevate themselves by organizing protest marches). Further emphasis on boov also is reflected in news that these were being branded, counterfeited and seized, and that there were shortages of boov. On February 8, a week before the first day of Tsagaan Sar, Marissa Smith shared an article from The UB Post on Facebook, which detailed how Ulaanbaatar government inspectors had seized not only potentially unhygienic but also counterfeit goods, including boov sold as associated with the Gandan Monastery and pickles with fake ‘Vagro’ (an imported Eastern European brand) labels which would be used to make many of the salads that are often part of the Tsagaan Sar table. In a comment on the article, Jessica Madison-Pískatá confirmed from Mongolia that there is indeed increased concern over such branding, and added that by the third day of the New Year, stores in Ulaanbaatar had completely run out of boov, bread, and anything else that might be used to construct the towers of tsagaan idee that center the Tsagaan Sar table. 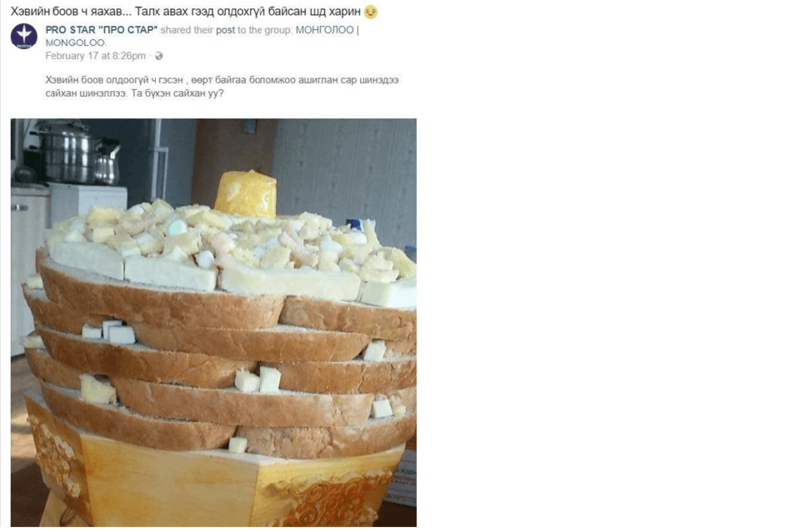 Madison-Pískatá shared a facebook posting showing stacks of European-style bread (talkh) being used in place of kheviin boov, reposted with a wry comment that indicated frustration at the poster’s inability to find even this ersatz (counterfeit?) foreign boov. “Even though kheviin boov is unfindable here we have had a good Tsagaan Sar (lit. ‘renewed well’). Are you all well?” Reposted with the comment: “Nevermind kheviin boov, when you can’t even find bread” (lit. ‘bread isn’t even available to buy’). While this post has had an overwhelmingly pessimistic cast, Smith ends with an eye to regenerative, transformative potential. Arranged in layers, boov are a ‘multiple’ part of the Tsagaan Sar spread, a quality of aspects of shamanic costume that Joseph Bristley (2015) has called attention to. Writing specifically about coins (zoos) on these costumes, Bristley extends the argument of Morten Pedersen (2011) about ‘multiplicity’ in shamanic costume (drawing on Martin Holbraad’s 2005 discussion of money and ‘multiplicity’) and highlights the ‘transformative’ powers of not only the shamanic costume, but also the power of money (itself in the Mongolian context at least not in fact completely, Bristley points out, transformable). Boov, Smith suggests, have kinds of multiple power that are like that of money, but also different, just as Bristley differentiates between the multiple coins and the multiple mirrors that might be found on a shamanic costume. In her work on ninja gold mining, Mette High discusses wealth objects (both pastoral wealth and mining money) as “objects that retain strong attachments to the spirit world.” High argues that this attachment ties these two forms of wealth together, particularly in the way in which the nature of the attachment affects perceptions of household prestige. In conversations with pre-Tsagaan Sar shoppers around Gandan monastery, Madison-Pískatá also observed a connection between wealth, prestige, and the spirit world, particularly in the connection between what one might call ‘spiritually prestigious’ spaces and places (e.g. the shar edlel shops around Gandan monastery) and prestigious goods. One shopper indicated that he was on his way to Gandan specifically to buy ‘Otgontenger’ brand incense for the holiday, explaining not only that buying from this area (as opposed to Naran Tuul market, for example) was the safest way to ensure the product itself was jinkhene (authentic, genuine, pure); but that sourcing it from Otgontenger mountain ensured that it would have the highest quality in terms of both smell and spiritual effect. Madison-Pískatá argues that the same might apply to other Tsagaan Sar consumables like boov. Household prestige is in this way linked directly to the spirit world via the spaces it travels through on its way up the supply chain: sourced from a certain holy place, purchased from a shop in a spiritually prestigious neighborhood, and brought to the ritual space of the Tsagaan Sar table. How then are boov powerfully money-like and not-money-like? It seems indeed that for this Tsagaan Sar season at least, they are not just inherently multiple and multiplicable, but have been carriers (moreso than money, issued by a government that is currently not enjoying widespread legitimacy and not aligned with stateness?) of both state-associated monastic and mountain powers, charging networks of interpersonal relationships consolidating while also extending beyond the Mongolian nation (pickles and their salads may have been underemphasized in this post! ), renewing them with productive potential. 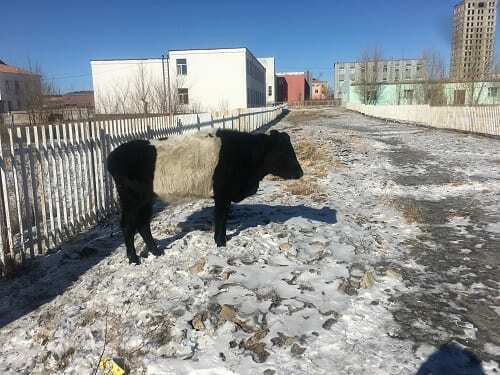 Taking advantage of new year distraction, a cow sneaks into town (herd animals are banned from the center in an effort to curb the spread of hoof-and-mouth disease. Photo by Jessica Madison-Pískatá. Watching Yag Tun Shig (a very popular signing competition) during a lull in visitation. Photo by Jessica Madison-Pískatá. Greeting the sun on shiniin negen (the first of the new year). Photo by Jessica Madison-Pískatá. Bayarsaikhan, Dulguun. Fake Labels Found on Tsagaan Sar Pastries. February 5, 2018. Buyandelgeriyn, Manduhai, 2013. Tragic Spirits: Shamanism, Memory, and Gender in Contemporary Mongolia. Chicago: University of Chicago Press. Bristley, Joseph, 2015. Transformation and Multiplicity: Zoos and the Power to Absorb Spirits in Mongolia. Inner Asia 17(1): 31-51. Bumochir. 2015. Mongolia’s Strategic Mine and the Conflict Between Civil Society, National Government, and Foreign Investors. Empson, Rebecca, 2011. Harnessing Fortune: Personhood, Memory, and Place in Mongolia. Oxford: Oxford University Press. Empson, Rebecca and Gregory Delaplace, 2007. The Little Human and the Daughter-in-Law: Invisibles as Seen Through the Eyes of Different Kinds of People. Inner Asia 9(2): 197-214. Empson, Rebecca, Liz Fox, and Bumochir Dulam, 2017. Tsagaan Sar Gift Index – 2017. Emerging Subjects Blog. Empson, Rebecca et al., 2016. Tsagaan Sar Gift Index – 2016. Emerging Subjects Blog. Empson, Rebecca, Uranchimeg Ujeed, et. al., 2015. Tsagaan Sar Gift Index – 2015. Emerging Subjects Blog. Fukuda, Chisato, 2017. A Fight to Breathe. Medical Anthropology Quarterly. Griffin, Hannah, Mongolia’s Liver Cancer Crisis: No Other Country Has A Problem Like This. November 7, 2017. The Guardian. High, Mette, 2017. Fear and Fortune: Spirit Worlds and Emerging Economies in the Mongolian Gold Rush. Ithaca: Cornell University Press. High, Mette. 2008. “Wealth and Envy in the Mongolian Gold Mines. Cambridge Anthropology 27(3): 1-19. Højer, Lars, 2004. The Anti-Social Contract: Enmity and Suspicion in Northern Mongolia. The Cambridge Journal of Anthropology 24(3): 41-63. Holbraad, Martin, 2005. Expanding Multiplicity: Money in Cuban Ifá Cults. Journal of the Royal Anthropological Institute 11(2): 231-254. Jargalsaikhan, Mendee, 2012. Mongolia – Without Vodka, Cheers with Milk. Mongolia Focus. Kh. Uyanga, 2016. Health and the Economy: Measles, ASEM, and the Elections. Emerging Subjects Blog. Pedersen, Morten, 2011. Not Quite Shamans: Spirit Worlds and Political Lives in Northern Mongolia. Ithaca: Cornell University Press. Sh. Tuya, 2016. New Forms of Political Protests in Ulaanbaatar: Calling for Justice Through Shoes. Emerging Subjects Blog. Waters, Hedwig. 2016. The ‘Slow Violence’ of Inaction: on the Apathy Towards Air Pollution. Emerging Subjects Blog. This post was compiled by Rebecca Empson, with contributions from members of the Emerging Subjects research group, and special reports from Liz Fox in Mongolia, and Bumochir Dulam in England. This is the third year of our Tsagaan Sar gift index (!). Our friends and interlocutors reported that this year the preparation of gifts and food did not take up too many days (or weeks beforehand), and, like previous years, many gifts were simple, Mongolia-made products like socks and scarfs. There was an emphasis on visits to families (and also documenting these visits on social media) within the first 2-3 days. Because the economic crisis continues, people reported that they were only giving presents that were an exact fit for the person (yag zoriulj avsan yum shig). In both the countryside and the city it was recounted, people only gifted items that were necessary, everyday items (heregtseetei yum), with less people gifting luxury things. Also, it was usual to only gift one item, or to gift money instead. Some people reported that while last year people greeted with 20,000 tg bills, this year – in both the countryside and the city – it was common to greet with 5-10,000 tg notes. People reported that ‘good quality’ products were the most important and many said that they focused more on preparing food (making buuz). So, in general, we see a trend of less days celebrated and less days spent preparing, an intense recycling of gifts, and a focus again on Mongolia-made products where possible, with a smaller amount of money gifted than last year. In the following, Liz Fox (ERSC-funded PhD student at UCL Anthropology) presents a detailed report from her fieldsite located in the Eastern ger district of Ulaanbaatar, of the shopping trip before the first day of the New Year, and the exchange and recycling of gifts that took place during Tsagaan Sar. This year Tsagaan Sar was celebrated in my fieldsite with a piece of cow meat instead of a sheep’s back. The meat was bought from the family’s son-in-law for 100,000MNT (Mongolian Tögrög, tg). 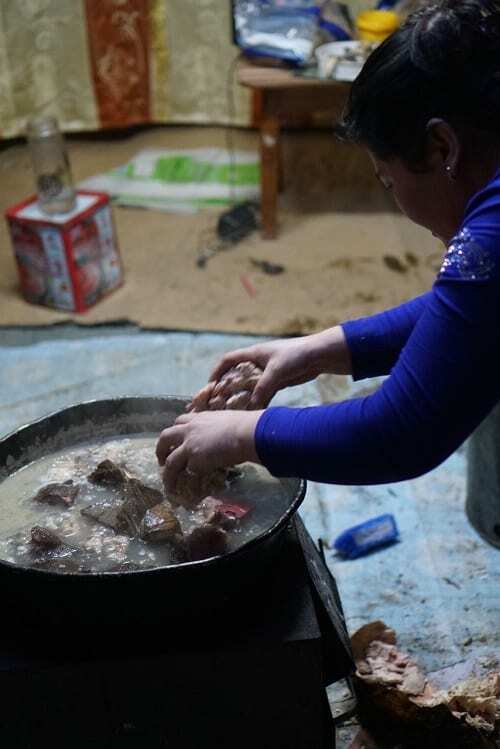 Just over 1,000 buuz (steamed dumplings) were prepared with goat meat and were made two nights before the first day of Tsagaan Sar (shiniin negen). We made some additional buuz on the night of bituun (the night before the first day of the New Year). One buuz had a 5,000MNT note hidden inside and was deemed the ‘lucky buuz’: whoever found it was deemed to have ‘met/coincided with’ (taarah) luck (az) and would be lucky for that year. A lucky buuz was made in a relative’s family but this buuz was hidden in the general Tsagaan Sar dumplings and was found by their son on the third day of Tsagaan Sar. Apart from the meat and dried shortbread (heviin boov), all the shopping for Tsagaan Sar was done on the day before the first day of the New Year (bituun). This was because the mother of the household was working up until that day and had no time to go to the market. Going to the market on bituun was less busy than had been expected, but perhaps that was due to arriving at 10am – when Narantuul Zah opens. That morning, I was asked to write a list of everything the family needed to buy (see below). The expenses of this year were reduced (as they were the previous year). I brought with me from the UK a large supply of gifts, particularly gifts for women (make-up, hair and beauty products) and children (notebooks, stickers, headphones). I also brought some gifts suitable for men (knives, cutlery sets), a large amount of general gifts (chocolates, sweets, candies) and three bottles of alcohol (two whiskies and one sloe gin). This meant that most of the shopping on bituun was for specific gifts for members of the immediate family and a few items to beautify the home. Saraa, a 47 year old mother of 5 who lives in an Ulaanbaatar ger district led our shopping trip to the market and was accompanied by her husband, two daughters (23yrs and 6yrs) and myself. At the market, we began at an indoor food-selling area and bought dried curds (aaruul) (around 15,000MNT) and some raisins (choosing 500g of the cheaper Chinese raisins at 7,000MNT/kg over the more-expensive Russian ones at 10,000MNT/kg). A large glass jar of pickled cucumbers (7,000MNT), a jar of tomato-based vegetable salad (salat) (3,500 MNT) and a plastic tub of mayonnaise (5,000MNT) was also bought. Saraa used the salary she had been paid in the previous days, which amounted to 70,000MNT. However, a mistake had been made at her work place – the hours of overtime that she and her colleague worked were confused by the boss and each woman’s pay was deposited into the other’s account. Fortunately, the colleague alerted Saraa to the mistake and the two met in the market where the colleague handed over 160,000MNT. 100,000MNT of this money was immediately given to one of the many people roaming the market selling ‘new bills’ appropriate for greeting (zolgoh) and gifting. The 100,000MNT was returned for a large stack of new 500MNT bills with 10,000 (10%) added for the exchanger. From there we roamed the open and semi-covered market picking up the items on the shopping list. The household items consisted of new plastic covers for the two tables, 3 meters of a gold and silver flower-covered design bought for 7,000/m (28,000MNT) and two new posters for the walls, a large one of a beautiful mansion (the shopkeeper said “This is a rich person’s house, may you live in one one day”) and a smaller one of a basket of exotic fruit (2,000, 1,500 MNT). A doormat for the entrance (4,000MNT) and two sets of 10 bowls were also bought: a set of larger, yellow, flower-decorated bowls for 2,000MNT/bowl and smaller simple white bowls for 700/bowl (27,000MNT). After that, specific presents for members of the immediate family were bought according to their needs. Underwear was bought for the teenage sons, 2 pairs for 2,000MNT/boxers and another for the 23-year-old daughter (1,000MNT), a pair of spring boots for the 7-year-old daughter (15,000MNT), three pairs of black elasticated trousers (7,000MNT), two for the 23-year-old daughter and one for the mother. The father of my family was supposed to have a coat, boots and underwear bought for him, but he resisted and nothing was bought. He was already carrying a heavy bag bought at the market (1,000MNT) containing all the purchased items and was perhaps resistant to the idea of ending up with more to carry. A toy car (7,000 MNT) was bought for the family’s grandson and a pair of jeans for the son-in-law (18,000 MNT). The largest purchase by far was a brass pinkie-finger ring that Saraa insisted on buying for me despite my protests. This cost 85,000 MNT perhaps showing that having a foreign ‘daughter’ who brings unexpected presents (thereby saving the family a great deal of money) can also produce otherwise unnecessary expenses. The elder daughter and I were also bought a pair of Mongolian-made socks (the present I had initially requested) for 2,500MNT each. Two large thermoses were bought as presents for maternal and paternal grandmothers. A new chimney for Saraa’s home stove was also bought just before leaving the market. It was decided that the 10 additional ‘men’s’ presents weren’t necessary – money would be given instead. The eldest teenage son had requested trousers from a more expensive shop (and had stayed home with his brother in a grump at Saraa’s refusal to buy such an expensive item for him). While at the market, Saraa relented and changed her mind. As we walked from the market to the nearby Nomin supermarket we passed a man selling pinenut filled pillows out of the back of a car and bought 3 for 2,000MNT each. We arrived at Nomin (also the work place of the eldest daughter). We ate lunch at the Nomin food court, sharing two dishes (total 20,000 MNT) and bought the expensive trousers for the two sons (24,900MNT and 32,000MNT). It was when we were leaving that we suddenly realised that while buying the pillows, someone had set down the table covers and the posters that had all been rolled up together and forgotten them. The elder daughter was sent back to check if they were still there while the rest of us took the bus to the smaller market nearer the home. There Saraa bought some apples, mandarins and nuts. The daughter caught up with us, saying that there was no sign of the lost items, so Saraa was forced to buy 2 more meters of table cover, both less beautiful and more expensive than the lost one (10,000MNT/m). The market had sold out of cucumbers and sausage (hyam) so we left and took a taxi home. There was no more money to buy extra basic provisions such as flour, rice and sugar but Saraa said we would get by with what was at home. In total, I calculate that the above came to approximately 471,400MNT. However, some items were missing, or were purchased before my arrival, and some prices have had to be estimated, so it is only a very rough guide. While Tsagaan Sar is celebrated simultaneously by the whole Mongolian society, there are fairly distinct layers and differences in how people celebrate. At my fieldsite, exchanging greetings with 500 MNT notes was common and only a few of the most elderly people were greeted with notes of 1000MNT or more. Gifts, here, were also of low monetary value, averaging only a few thousand MNT. Popular gifts included tights for women and socks for men. Among ger district-dwelling families there are also differences. I heard of families in Western ger districts greeting with a minimum of 5000MNT notes (rising to 10,000 or 20,000 MNT for more senior family members). In such areas, gifts were also more expensive such as 6,000MNT belts for men and 5,000-10,000MNT cosmetic sets for women. My apartment-dwelling friends from higher socioeconomic backgrounds also used 5,000MNT to 20,000MNT notes for greeting and exchanged gifts, with an average price of over 10,000MNT rising to expensive alcohols that can cost over 100,000MNT. Different groups also shop at different markets for gifts. Purchasing gifts at ‘Expos’ is a sign of wealth and distinction – evidencing the giver’s capacity to give a product manufactured somewhere other than China. Lower income families are restricted to purchasing from the city’s markets such as Khar Khorin in the West and Narantuul in the East. The poorest families may even be reduced to giving whatever they have at hand, including in some cases a ‘used’ product such as an opened container of body moisturiser. Giving away household items can also happen when a family’s supply of gifts runs low (e.g. raiding the cupboard for a bowl to give, or a bookshelf for a book) or even to give a particularly special present (for example, I was gifted a silver bowl at a wealthy friend’s home when I paid an unanticipated visit). Some gifting practices are universal across income divides. Primary among these is the ‘recycling’ of gifts. Most gifts received are, in fact, not kept by the recipient but upon returning from a visit are deposited into the ‘gift box’ to be given on again to those who will visit. Even the money collected from greetings is generally given on in a subsequent greeting. This practice is expected, but may also be counteracted in specific cases, such as when Saraa gave a cutlery set to her younger brother and insisted that he not give it away as it came from abroad and was of high quality. In the giving of the make-up I had brought, Saraa also made a point of letting relatives select colours that suited them and similarly telling them that this was high quality make-up that she expected them to keep and use! I pondered this myself and could only come up with a partial and speculative response about where all the money and gifts end up. My answer relies on the fact that although it is often presented as mutual, visiting one another is not actually a fully reciprocal activity. Firstly, the established custom is that youngers must visit elders, while elders do not necessarily visit youngers, indeed it is common for them to wait for an invitation that may or may not come, and may or may not be acted upon. As gifts are given by the hosts, and greetings by youngers to elders are more likely to involve money, there may be a degree to which gifts move down the age hierarchy while money moves up. Those in the middle generations thus serve as only temporary stopping points in these exchange networks. The terminal points may therefore consist of two distinct groups: the first is the very elderly. The second is the poorest and youngest families. The very elderly receive many visitors, but may not be physically capable of visiting their youngers, thus they collect money but not presents. The poorest, youngest families, on the other hand, may make many visits and collect presents but are not obliged to invite their elders for reciprocal visits that they cannot afford to properly host. Thus, they do not end up giving away the presents they receive. Such families save money not only by not preparing their own table and presents, but also by greeting their elders with only a silk scarf – an entirely acceptable and respectful form of greeting. The middle generations and middle-income families are the ones that probably feel the economic squeeze of the New Year most acutely. Steaming Tsagaan Sar meat on bituun. © Liz Fox 2017. Preparing the ‘dogs food’ on bituun. It is really important that they are fully fed, just like people. © Liz Fox 2017. Dawn on the first day of Tsagaan Sar overlooking the ger district. © G. Önöbold 2017. Welcoming the first sunrise on top of the mountain. © G. Önöbold 2017. Table on the first day of Tsagaan Sar. © Liz Fox 2017. Table at night of bituun. © Lix Fox 2017. In the following Bumochir Dulam (UCL Anthropology) reflects on his experience preparing for and celebrating Tsagaan Sar in London in the U.K. Celebrating Tsagaan Sar in London can be challenging and costly. Unofficial sources say there are approximately 2,500 Mongols in London, including students and migrant workers. Many of those living in London are relatively young, and away from their homes and families. Not many are in regular contact with each other and are unable to form an active community. Celebrating Tsagaan Sar usually takes place within the family, and with relatives and friends, with a particular tradition to show respect to the elderly. Because many Mongolians living in London are here on their own, it keeps the range of people one can visit to a relatively small group. 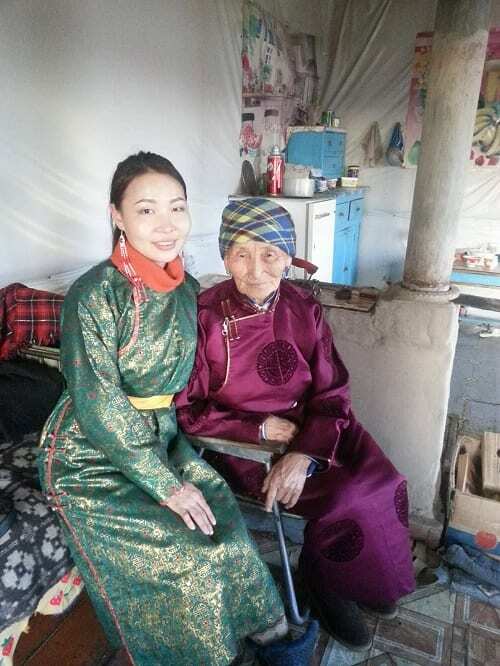 Families with elderly members of 50 years and above who have been permanently living in London for the last several years tend to celebrate Tsagaan Sar on a larger scale than others and host a larger number of guests, up to 20 to 30 or more. Also, those whose parents are visiting London tend to celebrate Tsagaan Sar. Others tend to celebrate within the immediate family circle with their children and close family friends. 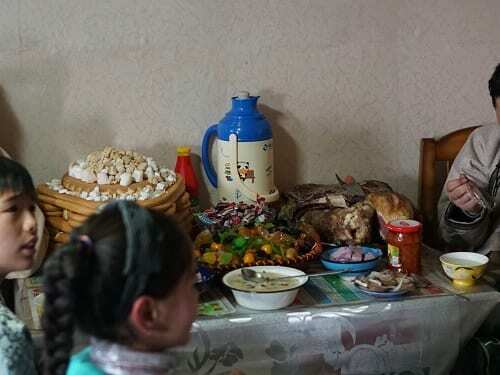 Those who celebrate Tsagaan Sar often have certain major expenses to buy sheep back (uuts), mutton (or lamb) to boil and to make steamed dumplings (buuz), hard shortbread (heviin boov), vodka, gifts and traditional costumes (deel) and boots etc. Most Mongolians living in London go to Smithfield wholesale butcher market located in the City of London near Barbican station. The market opens from 2am to 8 am. 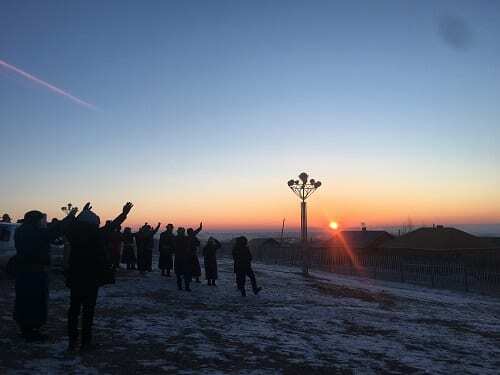 Although it is open during the night, it is one of the few places where one can see many Mongolians, especially in the week before Tsagaan Sar. When I went to Smithfield, I met several Mongolians, mostly men. Many of them bought at least one or two whole lamb or mutton. The cost of lamb or mutton was in average 4 to 6 GBP. The average weight of a whole lamb or mutton is about 20 kg and the total cost of one whole lamb was about 80 to 120 GBP. Unlike Mongolian sheep, sheep breeds in the UK are not fat-tailed. The fatness of the sheep tail and size matters very much. A UK sheep tail is always considered highly lacking and most inappropriate for Mongolian Tsagaan Sar. Sourcing hard shortbread (heviin boov) is another major problem for Mongolians living in London. Some people make it at home in their oven, while it is actually supposed to be deep-fried. 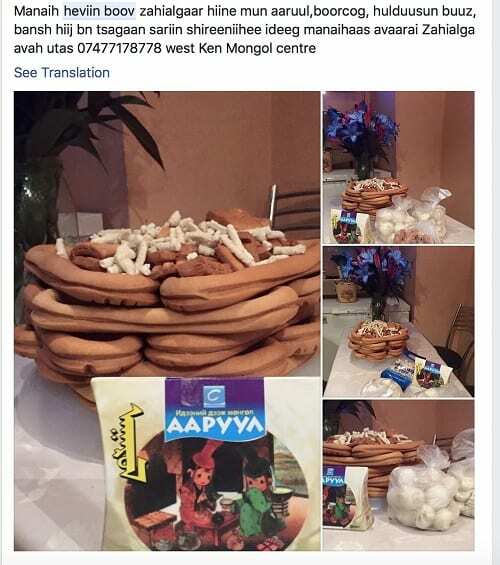 Some Mongolians actually make shortbread in London and sell them online in the Facebook group called “Mongol Ads in the UK” (UK giin Mongol zar). In the group one can find not only shortbread, but many other Mongolian-made products which cannot be found in London. These include dairy products, such as dried curd (aaruul) and cheese, Mongolian vodka, frozen dumplings, etc. Ads from previous years show that in 2014 the price of one shortbread was 4 GBP, in 2015, 10 shortbreads was sold for 35 GBP. Families need at least 9 shortbreads to pile them up in the form of a ceremonial offering. Under the Facebook group advertisement some comments from France asked whether they can buy them and get them sent by post to Paris; some others also decided to bring shortbreads from Mongolia. This year a friend of mine, Baagii, who lives in London decided to buy ten shortbreads from Mongolia and get them shipped from Ulaanbaatar to London by plane using a shipping company called “Mongol Centre”. Shipping by aeroplane cost around 8 GBP per kilo, and he had to pay about 60 GBP. An important beverage in the celebration of Tsagaan Sar is Mongolian Vodka. In London, it is luxurious to source Mongolian vodka during Tsagaan Sar, while many other vodka brands are available in any liquor store in London. Unlike shortbread, Mongolian vodka is always available in the above-mentioned Facebook group. A bottle of 0.75L Mongolian vodka is, on average, 30 to 45 GBP. It is a trend to wear Mongolian traditional clothes during Tsagaan Sar and Naadam. Although it is common for most Mongolians to bring traditional garments (deel) and boots from Mongolia to wear on certain celebratory occasions, when Tsagaan Sar approaches one can find many public posts on Facebook asking for a deel. It is growing in popularity to look for a pair of deels for a couple. The price range for a deel varies widely from 50 to 200 GBP, according to the material, design and craft. Many Mongolian women can also make deel, as it is a tradition for Mongolian women to learn how to sew a deel. When I visited one of my Mongolian friends in London, I met a Mongolian couple who were also there with their baby daughter. The couple and the toddler were wearing a Mongolian designer deel made with the same fabric. Apparently, it was the wife who made those. Gift are the next important part of Tsagaan Sar. Mongolians in London also use new bills of 5, 10 and 20 GBP as a gift when they greet (zolgoh) elderly people. If the celebration is in a smaller circle of family and friends, then gifts are usually intentionally prepared for each person (zoriulj avsan). In the case of my family we specifically brought from Mongolia some souvenirs, Mongolian-made chocolates and dried curds to give as gifts to friends. For example, we gave a small cast-metal golden horse headed fiddle (morin huur) and a collection of china with images depicting Mongolian national games. Tsagaan Sar table. © Tserendondog Erdenechimeg 2017. Dondog, Purev hai, Altaa Egshee. © Tserendondog Erdenechimeg 2017. Granddaughter visiting her grandmother in the countryside. © Tserendondog Erdenechimeg 2017. The USD – MNT exchange rate in late February was around 2,467MNT = $1.